Time to improve the visibility out there. Any suggestions on some good ceiling fixtures? No not Home Depot/Lowes or such. Griot's has some that are appealing. Any others? Prefer ceiling mount, not suspended. I got very good fluorescent cold weather fixtures from Lowes. My 2-car garage and loft are unheated and these start right up. The trick is in the positioning/mounting. A fixture that shines only down isn't much help in some circumstances. Copying what many shops do, I mounted mine at the ceiling/wall junction, shining out at a 45 degree angle. This floods the area with light. I do have a couple in the middle of the ceiling shining straight down (here when I arrived). and for fluorescent/hid - the ballast. starting in the cold and running quite are just a quality of a good ballast. i have very good ballast, in my "cheap home depot" housings... and i put very good color (not the cheap) lamps. that why when people see my garage lit up they saw "wow - this looks great!" and i put very good color (not the cheap) lamps. that why when people see my garage lit up they saw "wow - this looks great!" which bulbs and from where? Thanks. Installing is easy in almost any case. But, the 45 degree method I mentioned above spreads much more light than vertically hung fixtures. really. LED lights! We have them in the house and they are nice. Never any flickering, variety of bulb temps, and they put out a LOT of light. Disadvantage is getting a good beam spread can be hard, and of course they aren't cheap. I just put some lights in my garage. I only had three little light bulbs in it to start and while my garage is small 24x24 I have 16 foot celings. I went to home depot and bought 4 8foot t5 HO fixtures. They didn't sell the bulbs in store and wanted 11 bucks a bulb online. I found the t5 HO bulbs on 1000 bulbs.com for 2.73 a piece. They are 5000 lumens each, color rating is 5000K and the CFI is 87 I believe. I mounted the fixtures directly to the celing as I wanted as much room as possible for my lifts. It lights up the garage like crazy my friends are say its like a tanning salon in my garage now. I have a 3 car garage. My first time upgrading the lights I did half the garage with 4 of the 2x4 foot tube lights. They are ok, standard issue. But they do put off some heat when you leave them on for hours on end. I think each bulb is 40 watts, and I have 8 of them so that is 320 watts. I have seen the light switch get a little spark inside on some occasions when turning them on. And then put CFL's in them. I installed 5. 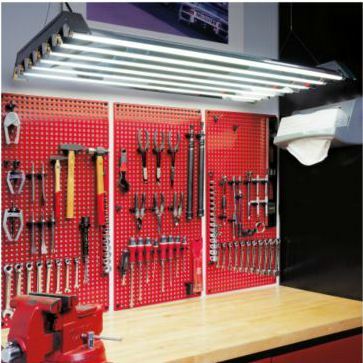 At 13 watts per bulb they produce alot of light, but have less power draw then just one of the 2x4 foot tube holder. I might consider replacing the long bulbs with more CFL's. It was like $40 total for the 5 CFL installs. That included sockets, bulbs, bulk wire, wire connectors. Since the sockets and bulbs hardly weigh anything I just drilled holes in the sheetrock right next to a rafter so that one of the holes on socket screwed into the rafter. Probably doesn't comply with code. For the connectors I used these little guys, made plexing out the wires to the other bulbs very easy. I installed track lighting in my 3-car garage last month. I have 6 strips of 4 lamps each. It's a mixture of halogen (good color and directionality) and CFL fixtures (more efficient and cooler). It has made detailing my cars in the garage much easier since I can use the directional light to check for swirl marks and other defects. Those track lights look VERY dim to me. I don't see why Lowe's/Home Deport, etc housings wouldn't be less better than some "designer" housings. The lights I have in my shop were about $30 a housing, T8 bulbs. I have 7 housings in there for general lighting and then a few more over the top of my welding table/workbench. My garage is about 24x26 in size. It's heater, but my shed out back isn't and the same lights work fine at -30*. T8 bulb is 32 watts each, about 3200 lumens each. The 25w CFLs are around 1600 lumens each. Would take 4 CFLs to equal 2 T8s while using around 100 watts vs 64. Metal Hylide works great if you have a tall ceiling. Usually 15-20ft or higher.